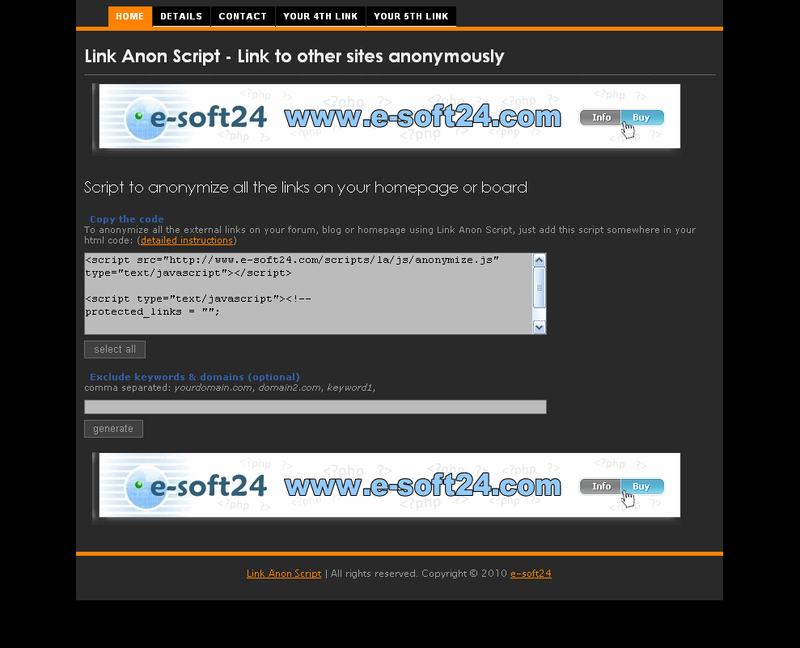 Start your own anonym.to clone site with this easy to use and install Link Anon Script. It is a great php script for a standalone site or to integrate the anonymize tools to your existing website. Webmasters can use this tool from your anonymize website to prevent their site from appearing in the server logs of referred pages as referrer. The operators of the referred pages cannot see where their visitors come from any more. This will drive a lot of traffic to your anonymize website or even to the website where you provide the anonymize tools. - Add your own links to the site head menu. - Easily add your own ads to the website. - Valid XHTML and CSS template. - Easy to customize template. - No database, no html knowledge required to run the script. - Easily edit your site Meta Tags (title, description, keywords). - Contact form to hide your email address and prevent spam. - Simply configure, upload the script to your webspace and your new site is up.